Mirroring the victorious celebration of the current Stanford Cardinal over Notre Dame on Saturday, several former Stanford players also made their marks in the NFL. With some career performances and a couple of big firsts, Stanford football had plenty to be proud of this weekend. New Orleans Saints first-round draft pick Andrus Peat made his first career start and played all 58 snaps in the Saints’ 24-6 loss to Houston. Peat played at left guard rather than tackle, a shift away from the Saints’ original vision for the rookie. Buffalo Bills rookie linebacker A.J. Tarpley ’15 also saw increased action as he recorded his first career sack in the team’s 30-22 defeat at the hands of Kansas City. 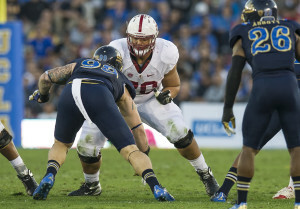 Moving to Seattle, it was a strong week for Stanford football in the Pacific Northwest. Although his status was questionable prior to the game due to an ankle injury he sustained last week, Seahawks wide receiver Doug Baldwin ’11 had a career day, leading the team with a career-high 3 touchdowns while racking up a career-best 145 receiving yards on 6 receptions. On defense, cornerback Richard Sherman ’10 nabbed his first interception of the season on a pass intended for Antonio Brown and returned it for 26 yards. He also recorded 5 combined tackles and 2 passes defended in the team’s 39-30 win over the Steelers. As in previous weeks, Sherman nearly neutralized Brown’s contribution to the offense, limiting him to 6 receptions on 12 targets for a mere 51 yards. Despite the team’s losing record (4-7), Miami Dolphins safety Michael Thomas ’12 continued to build on a strong defensive season, pacing his team with a career-high 10 combined tackles. In Cincinnati’s 31-7 rout of the St. Louis Rams, undrafted Bengals tight end Ryan Hewitt ’14 recorded 2 receptions for a career-high 29 yards. On a more sour note, injuries continue to plague Cardinal alumni in the NFL. Four former Stanford players are currently on injured reserve. Indianapolis quarterback Andrew Luck ’12 is week-to-week with a lacerated kidney, Philadelphia tight end Zach Ertz ’13 was out this week with a concussion, Green Bay receiver Ty Montgomery ’14 remained inactive after a Week 6 ankle sprain and Baldwin played through an ankle injury. Although the Colts have won their last three games without Luck and defensive tackle Henry Anderson ’15 (placed on season-ending IR in Week 9), other Colts Stanford grads have also seen limited playing time. Rookie defensive tackle David Parry ’15 recorded 1 assisted tackle, and tight end Coby Fleener ’12 saw 3 targets for 27 yards. Wide receiver Griff Whalen ’12, who had been gaining increased touches with Luck at the helm, was never targeted. With Luck expected to return before the end of the season, there is a chance for increased production among former Cardinal in the upcoming weeks. As the playoffs approach, many Stanford alumni across the NFL will seek to return from injury and increase their consistency to help their teams on the way to the postseason. Contact Olivia Hummer at ohummer ‘at’ stanford.edu. Olivia Hummer '17 is a managing editor of The Daily's sports section and writes about volleyball, football and baseball. When she's not filling in as an emergency copy editor, she can be found curled up in a ball bemoaning the misfortunes of her beloved Seattle Mariners or cursing the misuse of the Stanford Athletics logo. Olivia is a senior majoring in history from Covina, California, and can be reached at ohummer 'at' stanford.edu.